If you’ve been following along our offensive line rankings so far, you know we’ve been taking samples into last season to try and project which would be the best offensive lines in the upcoming weeks. This week we are doing it a little differently and purely looking at which offensive lines have been this best this season based on our grading. Obviously, with only a three-game sample size, this can still be heavily influenced by the defensive fronts they’ve faced, so keep that in mind. There’s no debate, here. The Rams’ offensive line has been a tour de force through the first three weeks of the season. They have been the highest-graded run blocking line and the highest graded pass-blocking line through three weeks. This past week against the Chargers, they somehow allowed only three pressures on 38 pass-block snaps. One of the most interesting storylines of the season so far has been how improved the Broncos’ offensive line looks. They currently sit as the fourth-best line in pass-blocking efficiency and second in run-block grade. Denver hasn’t exactly faced world-beater fronts in Seattle, Oakland and Baltimore, but you can only block the men in front of you. The biggest surprise has been the play of former fifth-round pick Connor McGovern, who has earned a 79.4 overall grade so far this season at right guard. There’s no shame in coming in third, especially with Jason Peters having missed some time again. When Peters has been on the field, he’s looked like his old self. He, Brandon Brooks and Jason Kelce all have pass blocking grades above 80.0 so far. The sack totals look bad in Green Bay, but the grading suggests they’re a tad inflated at the moment. They have the seventh-best pass-block grade of any team in the league despite facing some formidable defensive fronts. The standout has once again been left tackle David Bakhtiari, whose 87.9 pass-block grade is the second best of any tackle in the NFL. The Lions have been extremely up and down so far this season, but this past week’s performance showed exactly what this offensive line is capable of. They allowed all of five pressures on 40 pass-block snaps against the Patriots and opened up holes for their first 100-yard rusher since 2013. The Chiefs’ historic offensive start has truly been a group effort. Right guard Laurent Duvernay-Tardif has been the only player in their starting five grading below 60.0 at the moment, while right tackle Mitchell Schwartz has continued to look like one of the best right tackles in the NFL. He’s allowed all of three pressures in three games. The Bears have protected young quarterback Mitchell Trubisky to the tune of the second-best pass-block grade of any offensive line. The key has been the so-far elite play from left tackle Charles Leno Jr. and right guard Kyle Long. Leno has allowed all of four hurries, while Long has allowed one sack, one hit and two hurries. The Saints’ offensive line has been as advertised so far, but it’s been a shame that guard Andrus Peat hasn’t been able to stay healthy. In the one game he played against Cleveland, he looked much improved. The former first-rounder didn’t allow a single pressure on 37 pass-block snaps. The Falcons are currently top-10, but they may not be for too much longer. Left guard Wes Schweitzer has been a liability with Andy Levitre on the Injured Reserve. Schweitzer has a 55.3 overall grade in 119 snaps this season. The bright spot for the unit so far though has been Jake Matthews, who has the fifth-best pass-block grade of any tackle. The tackles for the Patriots have struggled at times this season, but the interior has been playing lights out. Center David Andrews currently owns the highest grade of any offensive lineman in the NFL through three weeks at 85.5 overall, while left guard Joe Thuney has earned the 10th-highest pass-block grade of any guard at 81.2. 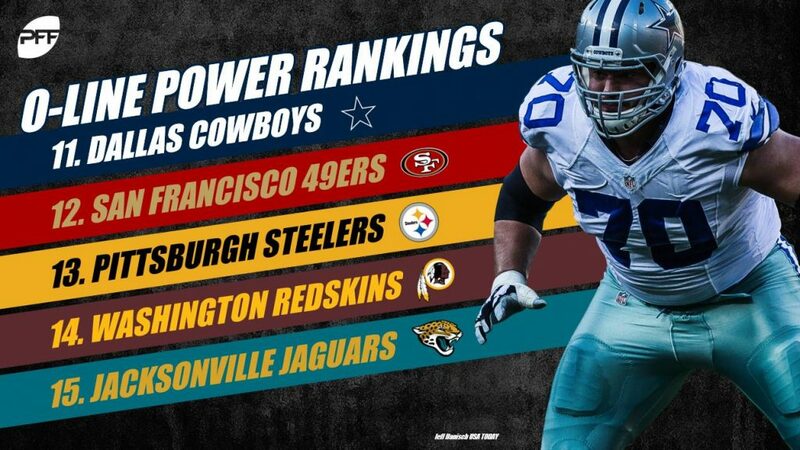 The fall of the Cowboys’ offensive line has been overblown. Of the 11 times Dak Prescott has been sacked this season, only two have been charged to the offensive line. Their issues have more to do with Prescott not finding open receivers than they do with the line in front of him. Mike McGlinchey has had some issues so far in pass protection, but his run blocking has shown the elite potential. His 79.4 run-blocking grade ranks second among all tackles. However, he’s given up multiple pressures in each game to start the season and has a ways to go in that regard. The once vaunted Steelers line has looked mediocre through the first three weeks of the season. As a team, they own the third-lowest run-block grade and are 20th in pass protection. They can’t even blame their struggles on the absence of right guard David DeCastro, though, as backup B.J. Finney has been fantastic. In two games, he’s allowed only three pressures in 114 pass-block snaps. Left guard is still an issue, but left tackle is undoubtedly not with a healthy Trent Williams. He currently ranks third in both pass-block grade and run-block grade among all tackles in the NFL. That’s the elite left tackle we’ve seen in the past. While the Jags were seemingly built as a run-first team, they’ve excelled more protecting Blake Bortles than creating holes for their running backs. They’ve only been charged with one sack so far and have the fourth best pass-blocking efficiency of any line in the NFL. While the interior is still a work in progress after the Josh Sitton injury, the Dolphins may have the most underrated tackle duo in the NFL. Laremy Tunsil and Ja’Wuan James have both graded among the top-20 tackles in the NFL. Tunsil’s improvement has been particularly impressive, as he’s allowed only two hurries all season. The Jets have been the very definition of an average offensive line in the PFF grading scale. Every single one of their starters has earned a grade so far between 60.0 and 65.0. That sounds about like the 17th-best offensive line to me. The Panthers have held up surprisingly well with backups at a number of positions. One of the biggest reasons why has been the standout play of right tackle Taylor Moton. He’s currently the highest-graded right tackle in the NFL at 81.1 overall and has looked like the starter of the future. Right tackle Chris Hubbard hasn’t quite lived up to his contract through the first three weeks of the season. He’s already allowed three sacks and nine total pressures while earning a 57.5 overall grade. Hubbard has actually been outgraded by rookie left tackle Desmond Harrison, albeit barely at 57.9 overall. The Titans have done everything in their power to deal with their tackle injuries in the passing game, but there’s no way to mask their struggles in the run game. They’ve earned the 21st-ranked run-block grade through the first three weeks with backup tackle Kevin Pamphile earning a 40.7 run-block grade in that span. 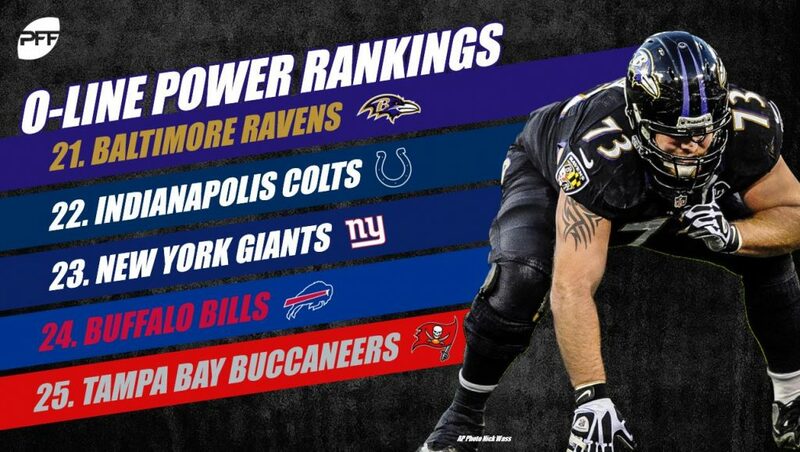 The Ravens have held up fairly well while protecting Joe Flacco, as the team owns the 10th-highest pass-block grade. It’s the run game where they’ve had issues. They’ve afforded the Ravens running backs a measly 0.8 yards before contact per attempt on the season. The tackle position in Indy has been nothing short of disastrous so far. The mix of J’Marcus Webb, Le’Raven Clark, Joe Haeg and Denzelle Good have combined to allow 31 pressures through the first three games. Quenton Nelson has done his best to improve the line, allowing only six hurries in three games, but the tackle position needs Anthony Castonzo. It’s beating a dead horse at this point, but right tackle has completely debilitated the Giants’ offense so far. The bad news is that backup Chad Wheeler has actually been worse than Ereck Flowers. Wheeler allowed three sacks this past week against Houston on 35 pass-blocking snaps. I’m not sure it would matter if LeSean McCoy had been fully healthy this season, as the Bills have earned the second-lowest run-block grade so far this season. Leading rusher Chris Ivory has picked up 66 of his 66 rushing yards this season after contact. That’s tough sledding. The ineptitude up front in Tampa makes Ryan Fitzpatrick’s electric start that much more improbable. Besides the fact that the Bucs running game has been non-existent behind this line, they’ve also given up pressure on 35.4 percent of Fitzpatrick’s dropbacks. On those plays, he’s earned a passer rating of 115.7 and thrown a ridiculous six touchdowns. A lot of people projected that the Raiders might have issues at tackle this season, but few thought it would come on the right side. While rookie left tackle Kolton Miller has held his own with only four hurries allowed through Week 3, veteran Donald Penn has not taken well to the right side. After playing a grand total of 24 snaps at right tackle his entire career before this, Penn has been a fish out of water. He’s allowed two sacks, two hits and four hurries for the worst pass-blocking grade of any starting tackle in the league. One doesn’t have to watch much more than last week’s tape to see why the Vikings are so low. Kirk Cousins was pressured on 32 of his 60 dropbacks against the Bills, as left tackle Reilly Reiff and right guard Mike Remmers combined to allow an unbelievable 20 pressures between the two of them. While Cordy Glenn has been a necessary addition at left tackle, the whole right side of the line has been predictably disastrous. None of the four players who have played center, right guard or right tackle for an extended period of time have earned a grade of 60.0 or above. Glenn has yet to give up a sack through three games, though, so they have that going for them, which is nice. Injuries have been an issue, but there’s still nothing good to speak of here. The Bolts have earned the second-lowest pass-block grade in the league and have been saved mightily by Philip Rivers’ quick release (2.37-second average, third-fastest in NFL). Maybe the only surprise about the Texans’ offensive line play this season is that there have been two teams that have stooped lower. They’ve tried giving their tackles a ton of help yet still have the second-worst pass-blocking efficiency of any offensive line in the league. Maybe the most concerning part, though, is that former second-round pick Nick Martin has so far not lived up to that billing in his third year with a 58.1 overall grade. Their pass protection hasn’t been as dreadful as we’ve seen in the past, but they are still the lowest-graded run blocking team in the NFL. Chris Carson and Rashaad Penny have averaged .4 and .7 yards before contact respectively. Good luck establishing the run with that. If you’re looking for a bright spot on the Arizona line, it’s going to be hard to find. D.J. Humphries leads the unit with a 58.0 overall grade. The most disappointing aspect of the offensive line, though, has been the performance of their guards. Mike Iupati and Justin Pugh were both, at their peak, top-10 graded guards in the NFL. Injuries have taken their toll in recent years, and neither looks close to that form at the moment.